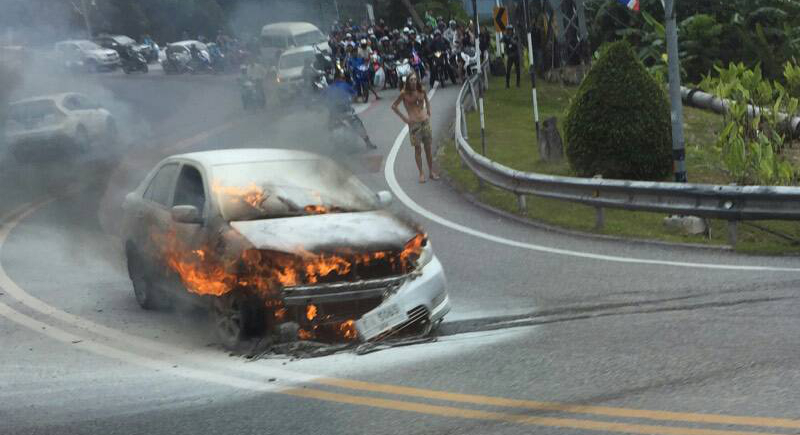 PHUKET: A French resident of Phuket escaped without a scratch yesterday (January 5) after the car he was driving burst into flames on Patong Hill. Called to the scene, 100 metres from the Sea Pearl Villas, police encountered Bernard Louis Joseph Hazebrouco, 68, who told them he was driving from Kathu to Patong on a Toyota Vios when he saw sparks pouring out from under the bonnet, quickly followed by flames. It took 20 minutes to put out the flames and cool the engine down to the point where the car could be towed away to Kathu Police Station, and traffic could once again flow freely.